Powerful Magento 1 feed tool for creating and operating product feeds for Google Shopping, Nextag, Bing, Amazon ads and many other comparison shopping engines. Don’t miss the chance to attract more customers and boost sales to your Magento store! Why do you need a product feed management tool? Everyday thousands of merchants upload to the CSEs (Comparison Searching Engines) hundreds of megabytes of feed - files with the complete information about products and their attributes. With no doubt, this solid set of data is regulated somehow. We do care about this and created a Product Feed - management tool, that connects your store with all types of CSEs and helps you to control and optimize your data quickly and easily. ...or simply create your own. 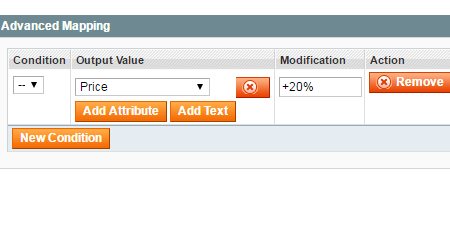 Specify custom prices and attributes values for each feed using custom fields. With this tool you can, for example, assign +10% to the price of the specific brand or model, simply change the name of the item, add a tax to the price and set many other conditions you need. Create unlimited number of shopping feeds and upload them to the shopping engine you need or create one feed and distribute it to any CSEs. Set time and interval for feed generation and distribution. 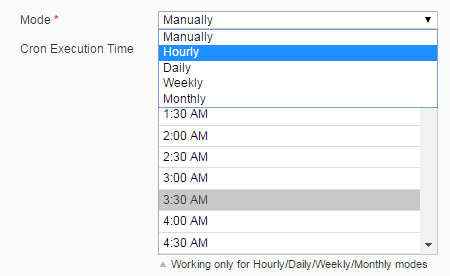 For example, you can generate feeds at nights to avoid decreasing site load speed on daytime. Specify price formats to meet the requirements of CSV you need. Support for AND/OR logics for advanced product filtering. Simply regulate product category attributes with ready-made templates and meet Google taxonomy requirements. Google Analytics Support: track the traffic from each shopping engine, tagging destination URL of each product with campaign tracking code. 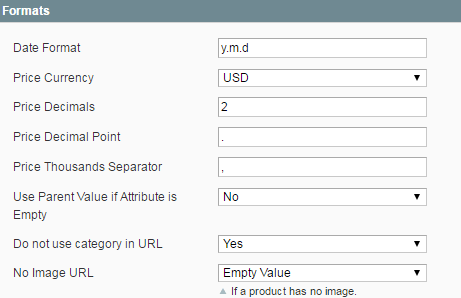 Generate user-friendly URLs with predefined product parameters to direct customers to the certain product configuration. The feature works for configurable products. Upload feeds to FTP/SFTP account or directly download them from Product Feed admin panel. Duplicate and generate feeds in bulk. Generate product feeds either manually or automatically. Manage your products: filter products by their attribute sets, identify and suppress underperforming products quickly and easily. Compress feeds in ZIP/BZ/GZ archives for fast downloading. - Set up and associate your categories to Google's according to taxonomy. - Select basic attributes (title, prize, description, etc.) to output in feed. - If you use some optional attributes like brand, color, size or other you can also select them to output in feed. - Setup automatic generation and uploading options. Does this module generate feeds for Bing? Yes, Product Feed by Amasty will create a Magento Bing Shopping feed for you. Are any feed templates provided with Product Feed? Yes, the Magento Feed extension offers you ready-to-use feed templates for most popular shopping engines, so there is no need to create feeds from the scratch. What if there is no ready template for my needs? Our templates are created for all major shopping sites. However, it is possible to create your own files if needed. We are always here to help, and you can contact us for assistance. Does this module generate feeds for Facebook? Yes, Product Feed fulfills Facebook feed requirements, as Facebook accepts Google feed template format. Can I create multiple feeds? The number of data feeds that can be generated with our extension is not limited. Can Product Feeds extension auto-generate and auto-upload the feeds? Yes, the module can auto-generate feeds and upload them via FTP or SFTP. Is it possible to generate feed for only particular products and categories? Yes, you can make it through changing filter configuration settings in the feed conditions. To see the screenshot go on reading. Can this extension handle export of thousands of products with many columns? Using the feed manager you can easily do the export in batches so that the server does not get overloaded. With such amount of products, it may take up to 10-15 minutes for the feed to get generated. Can I use product images which differ from those found on my store? For additional images you can use custom attributes, where you can store URLs to those extra images and then use the attributes in the feed. Can I change the name of the feed attributes? Yes, since Product Feed uses the values of attributes but not names. If you need to set up a different name for any attribute, you can do that via Custom Fields. Can I include a special price in the feed? Yes, with Product Feed extension you can export "Final price" that includes special pricing for products (based on catalog pricing rules). Can simple products within configurable ones be exported individually? Yes, the export of children products takes place when simple products are exported.Read on to see the examples. We’ve been using the extension for two years. It works fine. Feeds are generated in easy steps and you don’t waste time creating feeds yourself for every marketplace (with all this different requirements, you know). I’m planning to migrate to magento 2, so will start using extension for m2 soon. Hope it is equally good. Thanks to highly professional developer team, the module works the way it's described. Amasty guys timely release new updates and fixes, so I have no chances to pick at. The module works almost out of the box (with minimal tweaking). The support department appeared to be extremely nice and helpful. First, I want to address all the other reviews praising customer service. We typically avoid extensions that compliment CS before complimenting the product itself. We do not want to install something that doesn't work as intended in the installation instructions provided. With that being said, we did purchase this extension and got it installed flawlessly! We are so happy as we needed to submit product feeds to 7 different sites. This would have taken days or hundreds of dollars paid to our developer. It took us about 2 minutes to install and 30 seconds to generate our first feed. All in all we had our first 5 feeds submitted in 5 minutes. And the best part is, we did all of this without having to bother with contacting customer service (regardless of how great they may be) and waiting for a response. Thanks Amasty, we love your extensions and will continue to purchase them when needed. I am amazed by the level of support I received for fixing a feed attribute for the categories section to load into Google Merchant. I have had a huge number of exchanges in support tickets to sort out this one problem, the support I received was on another level, something I have never experienced with another service provider. I thought they may express frustration, but they should patience and determination for me to find a resolve. There was an alternative 3rd party service that we contemplated at a cost of £500 a month, but I knew this feed if set up correctly can sort a lot of our issues. Now that it is sorted it will be plain sailing, fantastic tool and fantastic support. This is almost a perfect extension, when you need to create your product feeds for Google Merchant and others. We use it with success for both Google Merchant Feeds, and feeds for our affiliates. We are only missing the ability for the extension to check attribute options stock status. Keep up the good work! Dies ist die beste Erweiterung auf dem Markt. Sehr empfehlenswert! Einfach einzurichten, benutzerfreundlich. Große Unterstützung ... Keine Beschwerden. Great extension which works as promised. I'm not a very tech person but I managed to create all the feeds (for Google, Bing and Shopping.com) effortlessly. But there is one problem I faced: I needed to exclude about 30 products from the feeds, so I used the corresponding tab. However, I had to exclude each page separately which took quite a lot of time. It would be great to have an opportunity to use RegEX for pages exclusion. I like easy settings and the ability to edit attributes in the feeds quickly and painlessly. I had some mismatches of fields in Shopping.com feed but then I just made some adjustments to the template and then everything was good. This mod isn't something I can't live without but still it helps a lot in my work. You can create all the feeds your self, but it's really really too long as you need to pick up all the subtle peculiarities of each shopping site. So this Feed saved my time on creating the files. However, if you need to create only one simple feed, you can go without any extension. Amasty support guy was extremely professional and courteous in helping me install this extension. The feeds I created myself without any problems. I had to email Amasty to get some more default feeds for particular sites and had them added within 24 hours. Great work! The plugin works even better than I expected. BUT! If you've never had to to do anything with xml feeds, you'll hardly setup the app without extra help. Fortunately, amasty guys instantly replied to my help request and configured google feed settings for me. Can't say anything bad about the extension. But please add more templates and multiselect for category condition. Then I'll change the review to five stars. It may take some time to understand all the possible features an d how it works. We were looking for the module that offers ready-made feed templates. And I was advised to try this addon. Fortunately it met my expectations and now I can use Google, Nextag and Bing templates instead of spending hours trying to create them myself. Each marketplace has its own requirements, so I think this app is a real bargain that saves your time and nerves. Yes, the module was not easy to configure, and yes – I had to contact the support department, but all my problems were instantly eliminated. I’m planning to generate some Yahoo feeds and hope the guys will help me out with it. The guys kindly helped me configure the feed for Yahoo (which is not supported by default in their templates). Actually, I'm satisfied with the tech support even more than with the module itself. Very good company, indeed. I was hesitating whether it will work for me at first, but their managers explained me how to configure the settings and upload the feed via ftp. I'm glad I've chosen this plugin among dozens of similar ones. This is a real catch, and I always know that I can contact tech support at any time and they will help me out. I recommend this plugin to everyone!!! Thank you, guys!!!! I'm fully satisfied with the feed tool. But a little bit messy documentation made me contact tech support a lot of times. Should admit all support managers were very helpful. It's a perfect tool for updating all sales channels inventory. It offers a pack of ready-to-use xml templates that we've been exploiting for half a year already. Yep, it took us about a couple of days to put everything in its places and understand how it works, but after all I think we've got cheaply and got a good tool that saves our time and nerves. I have a huge amount of products and the extension handled them easily, it created feeds in steps. I also like an opportunity to auto upload feeds to shopping sites as many of them (like google shopping) require monthly update of the feed. I contacted the support a few times and each of them was good experience to me. The extension is great and lets you do virtually anything for exporting your products. However, this extension needs better help docs, because if you're not a developer you will have hard times digging in. Big thanks to Kirill from the support team, he was very patient explaining the settings to me. I have 200K products in my store and I doubted if the module can cope with that amount so I double checked it with Amasty support before buying. As they promised, the extension works well with such a large catalog. What is more, it allows data export in steps to decrease server load. Currently I’m using Google Shopping and Nextag but I’m planning to use Bing and Thefind which are also supported by the extension. It’s really handy just to press a button and have everything done for you. I prefer downloading the generated feed right from the backend, but FTP download is also available (it can be chosen in data feed settings before creating the feed). All in all, the settings are not very easy, you should take time to study them and configure as you need. After that everything will run smooth. We were looking for the module that offers ready-made feed templates. And I was advised to try this addon. Fortunately it met my expectations and now I can use Google, Nextag and Bing templates instead of spending hours trying to create them myself. I like the extension, it works exactly like it should. I just wish it supported Amazon too. This is a must have extension for submitting the products in your Magento store to any shopping engine that accept data feeds. I use it to send data to Google Merchant Center, Bing Ads, Shopzilla, Ebay Commerce, PriceGrabber, The Find and Nextag. Setup is really easy if you are hands on with your store and understand basic stuff like mapping your attributes to the feed requirements of the sites you are sending data to. So fgar everything is working great and the best part is that there is no monthly data feed submission fee when you buy this extension so it will pay for itself very quickly! This is a must have extension. Saved me hours of programming time. Support is top notch! Highly recommended! We use a number of Amasty extensions on our Magento installation (5 on last count), and expect to purchase more in the near future. All have been well worth their cost, and the product feed extension is definitely one of our favourites in terms of ROI. It's easy to use and highly customisable. Currently using product feed to generate 6 feeds, and looking to increase it to 18 feeds on the one Magento installation. I've found that in most cases I've created a template feed and modified it to suit, instead of creating the feeds from scratch each time. Whenever I've had any queries about any of the Amasty extensions, the support team have always been prompt in their replies, which is pretty important when you're planning to use a set of extensions over an extended period of time. What i can tell you about the extension? - Perfect! Just perfect! Product Feed extension contains all necessary functional. It is a very powerful tool. Thanks to this extension i can expand my market. The opportunity to create lots of feeds is so necessary for me. I have been waiting for such extension for a long time from Amasty (because i trust them). And now i fully please with it. Everything works perfectly. Now my products became worldwide. I'm using Product Feed from the release date and i can say that it is the most useful extension for each online shop. And of course Amasty's support on a high level. Great works on my multi-store setup without issue. No problems with installation. Thanks for the amazing extension and quick support! This product was recommened to me and it is worth every cent. I have minimal computer experience, and the Customer service with this item was outstanding. fast, understanding and reliable. A company and a product you can rely on to get the job done. – Fix: issue with feed export when there are no products was fixed. – Fix: category related issues were fixed. – Fix: tag related issue with saving product feed was resolved. – Fixed an issue with an empty feed after generation when the 'tax_percent' attribute was used. – Inner improvements of category selection, price calculation and tax percents fetching. – Ready to use templates for Sear.com, cj.com, AmazonAds and several others. – Feed can be uploaded via Secure FTP. Useful for Amazon Ads for example. – Export products with no categories assigned. – New condition by empty values. Like products WITHOUT any special price. – Pre-configured feed templates for popular shopping engines such as Shopping.com, Google.com, Myshopping.com, Nextag.com, Getprice.com. You can just fine tune the templates according to your needs and you are ready to go! – Multiple performance and functionality enhancements.